« Breaking News! Ken Starts Blogging! Despite its assurances, GISS has adjusted the temperature records of two sites at Mackay to reverse a cooling trend in one and increase a warming trend in another. This study presents evidence that this is not supportable and is in fact an instance of manipulation of data. I decided to have a look at the temperature records of the weather stations closest to where I live, near Mackay in North Queensland. The Bureau of Meteorology lists 3 current stations: Mackay MO, Mackay Aero, and Te Kowai Exp Station, plus the closed station Mackay Post Office. GISS has a list of nearby stations. One is “Mackay Sugar Mill Station”. I had never heard of it. 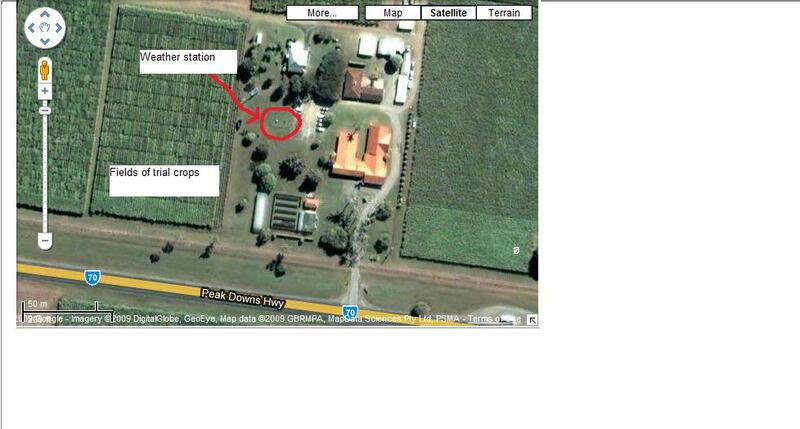 Te Kowai Exp Station, only a few kilometres from Mackay, is in fact at the same co-ordinates as Mackay Sugar Mill. 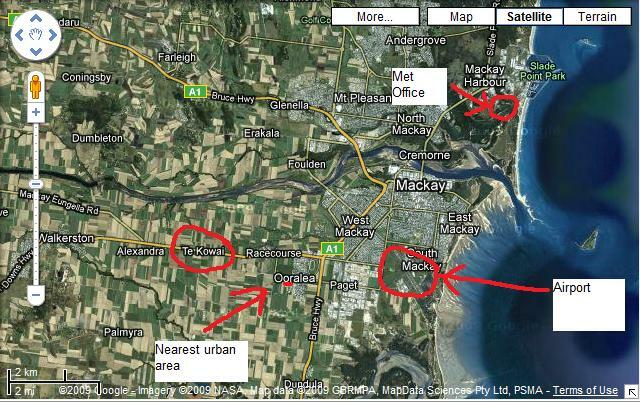 I checked on AIS for the GHCN site, and there is Mackay Sugar Mill on the map. The co-ordinates given by GHCN put it in the middle of a cane paddock 600m to the south of Te Kowai Sugar Experiment Station, so that’s definitely it! (If not, it’s identical in every other way!) And that is the closest weather station to my home, so I became even more interested. Te Kowai is an experimental farm for developing new varieties of sugar cane, run by scientists and technicians since 1889. It has a temperature record of over 100 years with only a couple of gaps. So in fact it’s an ideal rural station for referencing a nearby urban station, as it should have a similar climate. GISS combines GHCN data from all urban stations at the same location, and then homogenises this with data from neighbouring rural stations. So I then plotted the same-location data and the post-homogenisation data. A problem that appeared immediately is that the GISS annual mean runs from December to November, while BOM’s raw data is for calendar years. Most of the time it matches pretty well, but there are several examples of poor quality data. Another problem is that BOM does not compute a mean for any year with even one month of data missing, while GISS tolerates several missing months. Here are graphs of the results. Mackay- composite of the Met Observation office from 1959, Mackay Airport, observations from the old Post Office, and a short Comparison series. The airport, on the outskirts of Mackay, is cooler by nearly 0.5 degree- (More on this later). You can see why they abandoned the PO after 1949! 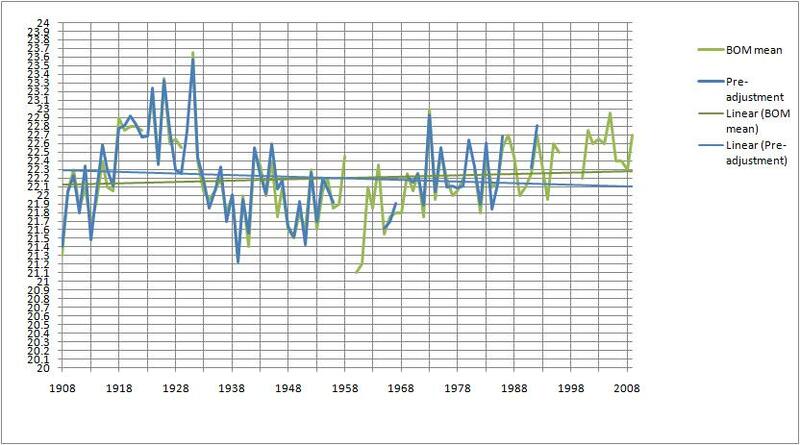 The airport’s temperature from 1999-2009 differs from Te Kowai’s by an average of 0.1 degrees warmer, whereas the Met Office is an average of 0.5 warmer than Te Kowai for the same period. The PO tracks Te Kowai for a few years but about 0.25 degree warmer, then goes haywire. Apart from the anomolous jump in the 1940s, the warmest year in both was 1931. 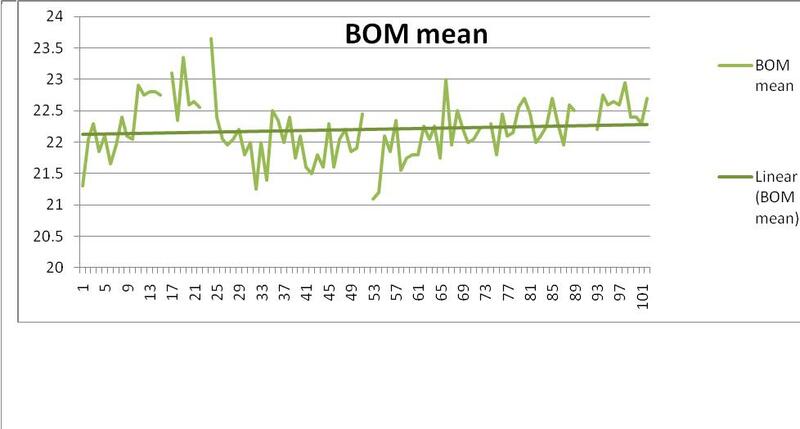 The unadjusted data tracks BOM very closely, except it trusts the airport temperatures over the MO! So far, so good. They completely disregard the PO data. What’s going on? The homogenised data starts out cooler and catches up. The adjustment makes the slope of the adjusted data trend line STEEPER! The trend increases from 0.9 to 1.2 degrees C over 58 years, or 2 degrees per 100years! If they had included and adjusted PO data to the same trendline, 1908 would have been more than 1 degree cooler. Now let’s look at Te Kowai, in the country about 7km from Mackay. Look how hot it was in the 1920s and 1930s! Also note a steady increase of say half a degree from 1950-2008, and a linear trend of less then 0.2 degrees per 100 years. Let’s look at what GISS does with this. The unadjusted temperatures pretty well match the BOM data, except that like most rural stations GISS stops the record in 1992. The linear trend of the unadjusted data slopes down, although the BOM data trends up again. Temperatures were much higher in the 1920s and early 30s. The hottest year was 1931. (The hottest summer was 1922-23). The next highest year after the 1930s was 1973. Only in the last 10 years have temperatures approached (but not reached) these levels. Some would say it’s a “Travesty”. Wow- when they adjust, they don’t muck around! Once again, the homogenised data is obviously different, showing much cooler temperatures in the first 40 years and higher at the end, with the result that the linear trend of the homogenised data slopes UP! There is now a warming trend of nearly 1 degree per 100 years. They have reduced the earlier warming but not eliminated it-1931 is still the hottest year. 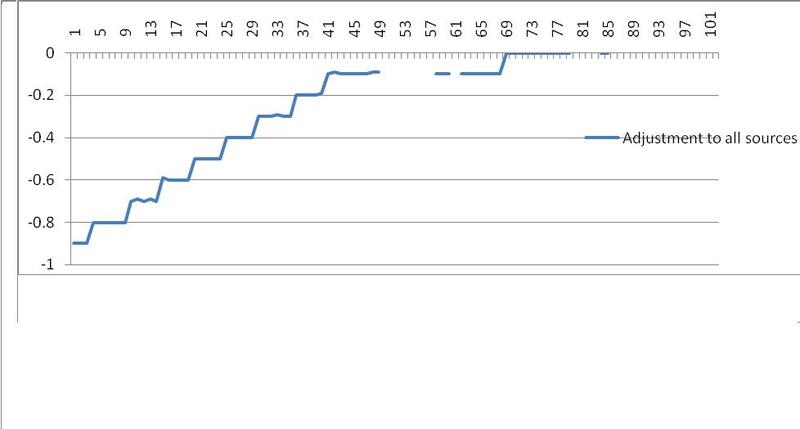 Below is a graph of the adjustments GISS has made to the GHCN data. Notice the step pyramid shape you’ve seen before at Darwin. 1908 is suddenly 0.9 degrees Celsius cooler. The adjustments finally peter out to 0 in 1976. So why didn’t GISS use the Te Kowai data to adjust the Mackay data, and make the Mackay trend less, not more? After all, Mackay has an Urban Heat Island effect, whereas Te Kowai’s should be very small. And why did they adjust the Te Kowai data at all, and so much? Supposedly, they compare with nearby sites and make adjustments. But what nearby sites? To adjust Te Kowai, they must surely use only those with records from the early decades of the 1900s, like Clermont, Bowen, Charters Towers, Emerald, Barcaldine (too far away in my book). These are small-ish towns from the same 5 x 5 grid area as Mackay, even though they have vastly different climates- much drier for a start. Because they are “rural” GISS does not adjust their data at all. The good thing is, I’m familiar with all of them. I also looked at Ayr and Mt Morgan, “nearby” rural towns but outside the 5 x 5 grid, and Willis Island, out in the ocean. Clermont (250km southwest) has a 0.8 increase/100years and was warm in the 1920s-1930s. 0.7 degrees? But note the jump (UHI effect?) in the 1980s and the step down with the change to the airport, so handle cautiously. Also, warm years earlier. 0.8 degrees over 100 years? Note the large step up (UHI effect? ), after a declining trend, from the 1970s onwards, when the town boomed with expansion of irrigation, then coal mining. Also note the warm period in the early 20th Century. Airport data seems flat or lower. Handle cautiously. A huge jump of over one degree in early 1970s after a declining trend, so probably a change in surroundings- UHI, it’s a council depot after all- when compared with the DPI research farm just 6.3 km away. Also, this is evidence that GISS did NOT combine all records at this location. Not reliable. If used, an increase of 1 degree over 80 years, or 1.2 degrees per 100 years. Many gaps. A small decrease (1920s definitely hotter). Far inland, Barcaldine has a continental climate. Nearly 1 degree rise over 100 years, dropping lately. Too far away to be seriously considered as “nearby”. I also looked at Willis Island, far out in the Coral Sea, and only from 1923, but the nearest island site with a long record. Flat as a tack. BOM shows a very small rise. Should be a good site for checking ENSO effects. There are no other sites within 500km with a long record. The mean of the warming trends of all land based rural stations excepting Te Kowai is 0.77 degree Celsius approximately per 100 years. Leave out Mt Morgan it is 0.93. With Te Kowai it is 0.7. Two unexpected consequences of this study are I believe I have discovered an Urban Heat Island signal in small towns, and it seems airports are not necessarily warmer places. So: The GISS adjustments result in increasing the warming trend in Mackay, and introducing a non-existent warming at Te Kowai. 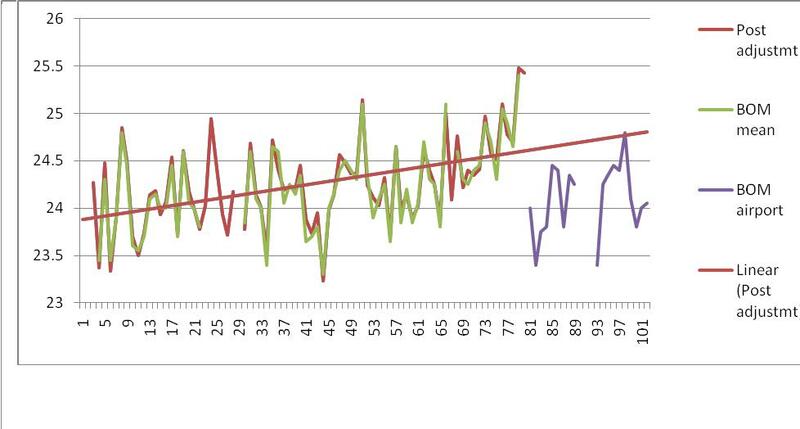 Te Kowai and Mackay both end up with warming trends of 1 degree and 2 degrees per century. Now, GISS probably have a perfectly satisfactory algorithm which applies over most of the world, which averages the data of nearby stations to correct UHI effects in urban areas. However, only ONE “neighbouring” station has a warming trend of over 1 degree per 100 years, and it has a noticeable UHI effect of its own and in my opinion shouldn’t be relied on, (and another high one is hundreds of km inland.) All of the other nearby sites with long records have much less than 1 degree warming, and most have noticeable UHI effects. Most, like Te Kowai, show a warm period in the early 20th Century. The mean of the trends of all neighbouring long term stations (0.77 degree Celsius approximately per 100 years) does not warrant these adjustments. Even if they use the trend of the long term mean of the rural stations this is still only 0.9 degrees, and less than the homogenization adjustment for Te Kowai. Further, the UHI of Mackay is corrected UPWARDS. How can GISS justify their manipulation of the data, which they claim not to do? How have they arrived at the adjustments for Te Kowai and Mackay? And besides, don’t they say that urban stations are adjusted by comparing with rural stations, not the other way around? They don’t adjust any other rural stations that I’m aware of. They are allowed this manipulation simply because GHCN has declared at some stage “Mackay Sugar Mill Station” (Te Kowai) to be a “small town”, with a population of 35,000. Exactly the same population as Mackay. Well, actually it’s surrounded by cane fields which have not changed much for the last 130 years, is about 7 km from Mackay and 2.5km from the nearest suburb (Ooralea). There are 2 or 3 buildings around it for the manager, greenhouses, and laboratories, and its population on a good day might be… 10. This has allowed them to adjust its data, when other rural sites are not adjusted. It also allows them to NOT include the pre-1950 data from Te Kowai with the other rural stations, when adjusting Mackay’s data. Why do I suspect this is deliberate? Because the Te Kowai GHCN data ends in 1992, just like all the other rural stations in this area. It was once classified as rural. Early warmer temperatures are artificially cooled. These two stations now have an extra warming trend and now do their bit to support the warming trend at the other 2,300 stations worldwide. And it’s happening in my own backyard! I’m furious! This entry was posted on February 5, 2010 at 1:39 am and is filed under Uncategorized. You can follow any responses to this entry through the RSS 2.0 feed. You can leave a response, or trackback from your own site. which might reveal similarities with what you are finding. These two little cartoon diagrams are very revealing. Good luck Ken. Hope you enjoy blogging and the commenters are nice to you. Not that I have much time, but I’m considering a similar study for Adelaide and surrounds..
GISS now uses *one* station (Adelaide Airport) if I recall correctly, within 300km or so of Adelaide (I’ll be checking again when I do the study), and GISS appears to have combined data from stations that were km’s away (and more than likely sited differently) from the airport (the current airport was opened in about 1954) and included it in the history. I am also unhappy with the Adelaide ABM numbers. I am old enough to remember much hotter periods and longer hot period durations than those the ABM are saying are the ‘hottest on record’. Others older than I have related earlier higer temperatures and longer hot period durations than those I remember. I have queried the ABM on this and have merely been brushed off. If I can help with your investigations, please contact me. You’re not the only one.. many, many people know it has been hotter, cooler, wetter, drier in the past. We know climate changes. The problem is when data is used selectively or homogenised in the wrong direction i.e. making UHI worse. Thanks folks. I’ve since found a small error in my work which I have corrected, but it made no difference to my findings. I’m planning to continue with other Qld towns and rural areas. Ken, I wonder if our BOM has any say in what data is used by the global mob? Have you considered asking them? If they answer “no”, I for one would like to know why not. I have just finished my first speed read through your analysis of the Mackay temperature history. The serious read follows. Would it be OK if I print it off and perhaps highlight bits – bigger graphs etc – maybe put your summarising comments in red and bold print – and take it down the road to the office of my favourite Senator? Mitch Fifield takes an interest in these matters and appears to have certain reservations about the IPCC. I have just spoken to his office and they say that such a document would be welcome. It is an election year and climate will be debated. It would help if I could attach your address and perhaps qualifications, so they can do their verifying stuff. Could you email that back to me please? I suppose that one can not look at all the weather stations but Gayndah PO Qld Australia (station code 39039) commenced in 1870 for rainfall and temperatures records go back to 1893. It has now been replaced by Gayndah Airport (station code 39066) There was an overlap period (2003 to 2009) which showed that the airport was 0.2C lower than the PO which one can put down to UHI effect at the PO. There will also be some UHI effect at the airport (bitumen tarmac). The highest annual mean temperature at the PO was in 1897. It depends where one wants to start for a trend. If one takes 1897 (or the years on either side) there has been a negative trend especially considering the recent UDI effect. One can say with certainty that there has been no increase of average mean temperature at this rural (small town) site in the last ten years. However I think this weather station does not into the data used by GISS. They are sent or prefer data from larger stations that have much bigger UHI. I grew up near Gayndah and know it well. Yep I’ll be looking at it and many other Qld stations. Thanks. Fíjense en esta gráficas de los datos brutos de temperatura de la estación Te Kowai/ Mackay Sugar Mill en el continente austealiano: Ahora fíjense en la comparación de esos datos con los datos “cocinados” por GISS: Intersante, verdad? Si …..
Great stuff. Have you sent the results to NASA GISS to ask them for comments and to ask how they justify their adjustments? No but I will. Having modem problems at the moment. Ken – a superb piece of work – thank you. You might have a look in some of the data that E.M. Smith has up on GISSTemp etc at http://chiefio.wordpress.com/. In the “rural” airports used for adjustment I found it interesting that Charleville and Quilpie had each been used to adjust 1 other site, Roma 12 and Richmond Air Force Base 26. You might find something on Mackay in this file too. E.m.is quite approachable, so if you show him what you’re doing he may be able to get you a list of what stations are adjusting the ones you’re interested in. His email is in the “about” tab. Stay angry and keep up this fantastic work!!!! At some point you would think that any/some MSM “journalist” would start to understand the obvious (and increasingly VERY obvious) data manipulation. What fun that they now have NOAA to take this information and disseminate it to more people who want to make critical decisions for the future based on climate. The new Climate Service at NOAA description reads like a shopping list for alarmist scares. More fair, unbiased, and honest data to be reformulated and rebranded as “real”. Of the different data massaging machines, NOAA has been found to be the most egregious massager. Now we can treat NOAA like the Met Office; check their predictions and assume the opposite. 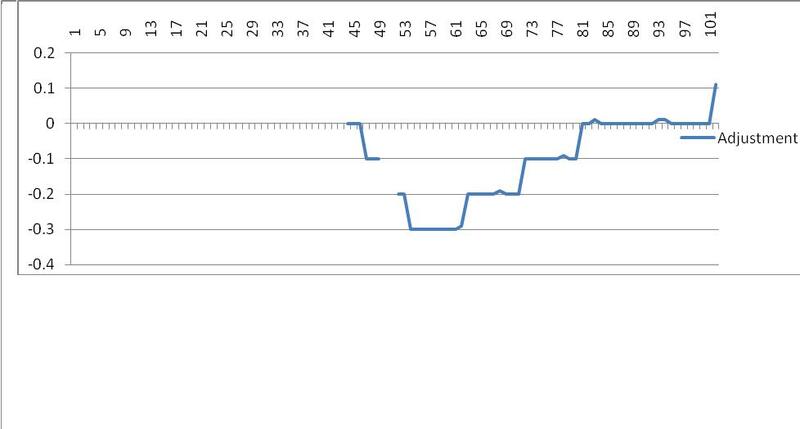 Can you plot on your graphs the daily max and min temperatures, along with the upper and lower standard deviations? The average temperatures is a calcuation. It would be interesting to see what the actual measured temperatures are doing. 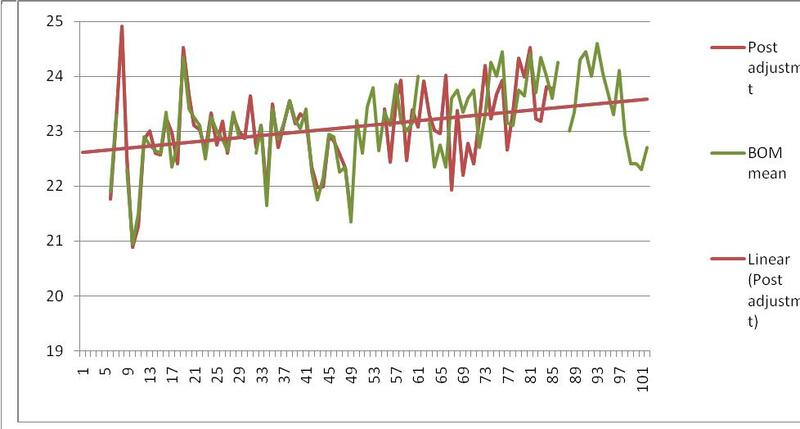 Thus “global warming” is nothing more than a narrowing of the yearly swing in temperature. A more moderated range of temperatures. We are not getting hotter at all. Yes. But you can also check directly at BOM as their graphs are for max and min. Will be doing this later when checking for small town UHI effects. Richard- that’s good gear! I believe the same thing is happening here- winters somewht warmer. So I’ll follow up with a similar study later…. when I get time! put up a tip jar? many appreciate the work you and others are doing to expose the institutionalized prevarication of giss data, the ipcc, noaa, and other quasi-scientific political organizations. fraud is fraud, and when the stakes are in the trillions of dollars and the alarmist harm is rapidly starving the third world, the consequence is, really, criminal. Splendid work — thanks for doing this. I suspect the GISS boilerplate response to studies such as this will be “these are simple oversights and they all average out.” If so, there must be some cases of GISS adjustments rendering a grid cooler than appropriate. Found you via WUWT. Either these unwarranted adjustments are caused by system programs and therefore should be found in all similar cases worldwide or they are being applied on a one by one case which points directly to human interference. Both cases can be by either mistake or purpose and I will be curious which flavor these elevations of temperatures by GISS fall into and whether they will be forced to correct their mistakes. If never corrected, it is intentional and is at the governmental level and should therefore be illegal. Wish we still had honest investigative journalists around that carried some weight. Great work Ken, 2 boots on the ground are worth a hundred on desks 6,000 miles away. I’ll be using your example in a presentation made before the U.S. Air and Waste Management Association, a mainline scientific body that has decided to host a session discussing temperature records. I’ve gone back to the original sources to validate your data but will use your graphics rather than rebuild them for this paper, naturally citing to you and this blog post. I’ll send you a copy of the paper and powerpoint presentation upon completion. The meeting is in June in Calgary, and the paper will be embargoed until then. Best regards and thanks for this outstanding example of the problems at GISS (and CRU, for that matter). Wow! I’m putting up some changes (2nd edition) this arvo so please check some small changes- not major though. I have all my data on an Excel file and am most willing to send to you if you wish. Well done Ken. A nice investigation well reported. It’s clear you ‘get’ the purpose of blogging. Please keep it up. Delightful to see an enthusiastic amateur hitting a home run. I suggest you get in touch with William Kininmonth- William Kininmonth is a meteorologist and former head of Australia’s National Climate Centre. He was Australian delegate to the World Meteorological Organization’s Commission for Climatology (1982-98), including two terms on its management board and is the author of Climate Change: A Natural Hazard (2004, Multi-science Publishing Co, UK). He is a meteorologist and might help check any weaknesses before you go too public. Excellent analysis! Thats amazing – this kind of thing is cropping up time and time again. I’d like to do the same with the data around Perth too but I don’t even know where to start. I’d be willing to bet there’s been widespread adjustments made to pretty much everywhere – maybe not maliciously, but certainly incorrectly. Go to the websites I mentioned- BOM has data for download. Make sure you check closed stations as well as opne. Then check GISS for Perth and nearby stations and c/f with BOM. Thank you for this, another nail in the coffin of these con men. One of the audits we’ve suggested on GISS data is an audit of the rural classification. the population figures they use are out of date and in some cases wrong. Hansen experimented with a ‘new” methodology for the US. uses nightlights. The path to true temperature can be complicated by versions. The BOM are revising their work over the years and there is no simple set of BOM standard data. Even the BOM online data need not agree with the CD products from the BOM. It might help to put a source and date of the data on your findings. When people like NOAA and GISS get data from the BOM, they might adjust it, but it is hard to work out which BOM version was adjusted when and which is used by NOAA/GISS. I have found cases where the USA adjusters use old data now rejected by BOM on quality grounds (e.g. Coonabarabran). I have lived in both Mt Morgan and Mackay and once applied for a holiday job at the Sugar Research Institute, so we are on familiar ground. I would suggest it safe to use the Institute as a rural example and would, like you, wonder why it needed adjustment. However, the situation is more complicated than it seems. Mackay is a coastal town. In Australian studies of the last 40 years, I have found coastal temperatures to change hardly at all, whereas places inland 200 km or more commonly show sharp increases in temp. I do not know why, because it has to be a temporary pattern otherwise extraoplation forwards or back rapidly goes into unrealistic temperatures inland. The Walter Hall house at Mt Morgan was lived in by the founders of the world famous Walter and Eliza Hall Medical Institute. I have dined in the old home. (BTW, another person who became rich at Mt Morgan was Willian Knox D’Arcy, who went to Persia and spent a fortune looking for oil. When he found it, nearly a decade later, it was the historical beginning of British Petroleum, BP). The Walter Hall site is possibly one of the rare global examples of reverse UHI, because the population and activity surrounding the home decreased steadily since it was built. At its peak in the 1930s, the nearby Mount Morgan mine was the world’s biggest single gold mine, eventually producing about 10 million ounces. At a guess, the population today would be 10% of the population then. Does anyone else know of a station where the “lights” system would show a population decline over the decades? 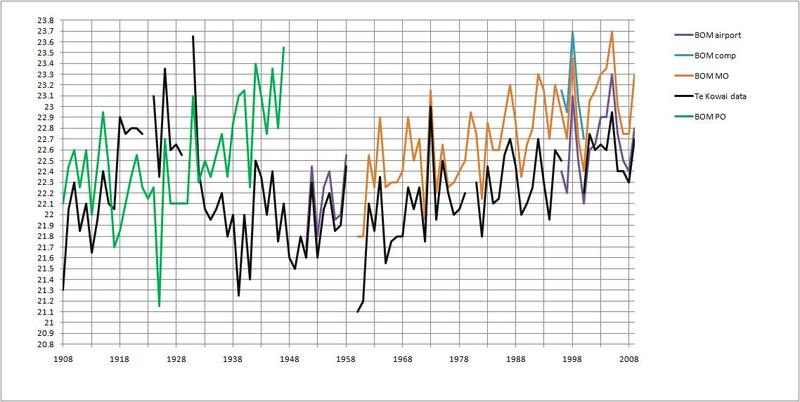 My data sources are at the bottom- BOM climate data , date January 2010. Still shows same data.. Interesting re inland temps too… will try to check this in the future. Believe that your study says a lot, as being individual and without sign of bias, and so makes a significant contribution to showing that “the science” needs a serious rethink. More recently Chiefio on his blog at http://chiefio.wordpress.com/ has done some work on this method. See the dT/dt archive. Go get em Dad, Its good to see you making a difference to the world. Watch out for dark coloured cars and men in suits with dark sunglasses. There is too much money at stake for too many people to let small time people like you ineterfere. Or have I watched too many movies…. Check out http://www.physorg.com/news183723896.htmlf for more evidence that sea levels have changed little over the last 2500 years! Reported in local press last year,head of Tweed branch of NSW Canegrowers says evidence collected by the group shows the Tweed climate is getting colder not hotter. 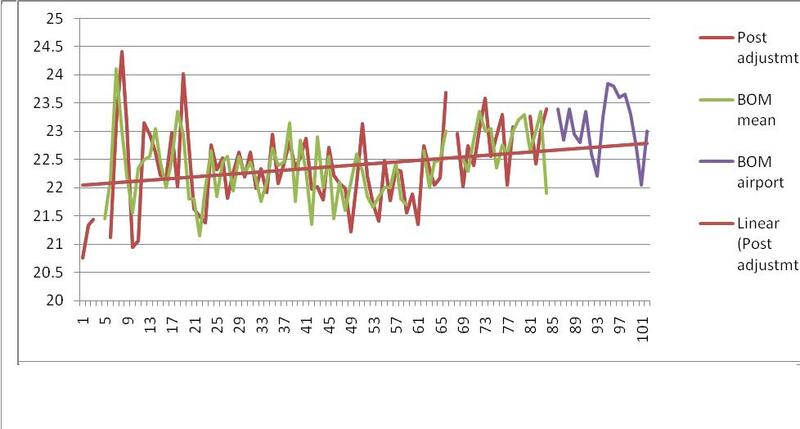 Weather data collected at Condong Sugar Mill for over 100 years records little change in temperature patterns. Concerned about frost on yeilds,an industry bureau has been asked to fast track frost free strains. The temperature station on the grid is located at Tweed Shire Council’s sewerage works at Bray Park Murwillumbah. In light of the anomalies above…..Any chance of checking out Bray Park ? very interesting research Ken !!!!! I’ll be checking Qld first, but a number of concerns like yours have been mentioned so I will check out the data in your area- when I get around to it! CSIRO predictions are based on models, not past observations, so they can never be wrong…. I was studying something else about this on another blog. Interesting. Your perspective on it is diametrically contradicted to what I read in the first place. I am still contemplating over the different points of view, but I’m tipped to a great extent toward yours. And irrespective, that’s what is so good about modern-day democracy and the marketplace of ideas online. Lucia at The Blackboard has a running series on how well the IPCC “spaghetti-graph model results” are doing in “projecting” global temperatures since their start. And the results aren’t too good. you’ll see that this mix that isn’t “projecting” too well includes two versions of CSIRO’s model. I was searching for background regarding meteorological equipment when I found your internet site site via Live search and your webpage grabbed my curiosity. I have 2 data sets. 2 – The data used by Torok in 1996 when he adjusted the Australian Temperature data set – 1908 – 1993 including the adjustment method etc. 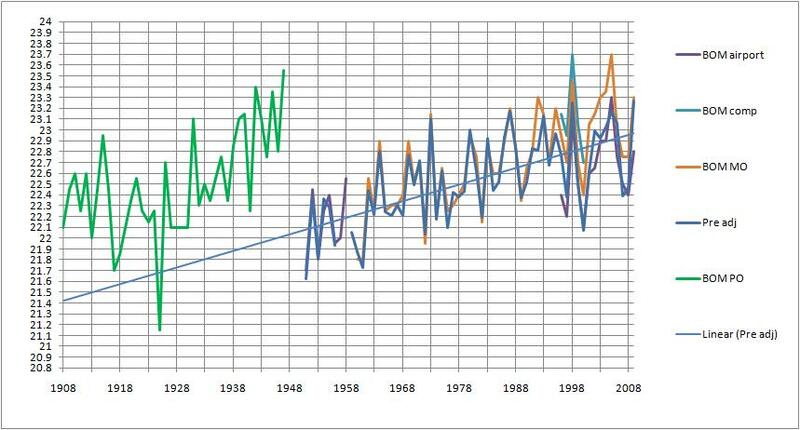 I also have a chart from GISS of the temp – 1908 – 1993.
would the real Casino Airport data raise it’s hand. 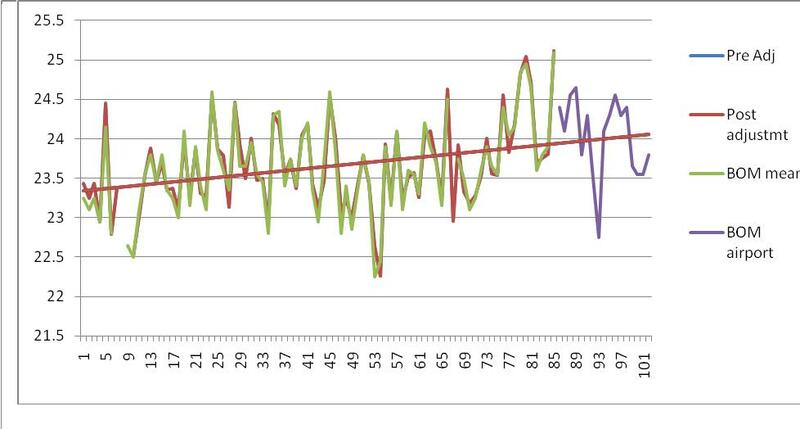 The current BoM data trend is horizontal, the Torok trend shows .7C warming due to the adjustments. It’s unlikely that Casino had an airport before say 1940, so the terminology needs clarification. Try using the lats and longs on Google earth, though I suspect 4 places after the decimal degree are not enough. As noted on WUWT, Casino records started in 1858, quality dubious. Sometimes there is an unrecognisable name associated with a town, like an experimental farm. You might need to get the BoM data and so a sort and match of closest lats and longs. sorry I made an extra space between Casino and Airport. Thank you for the post Ken. 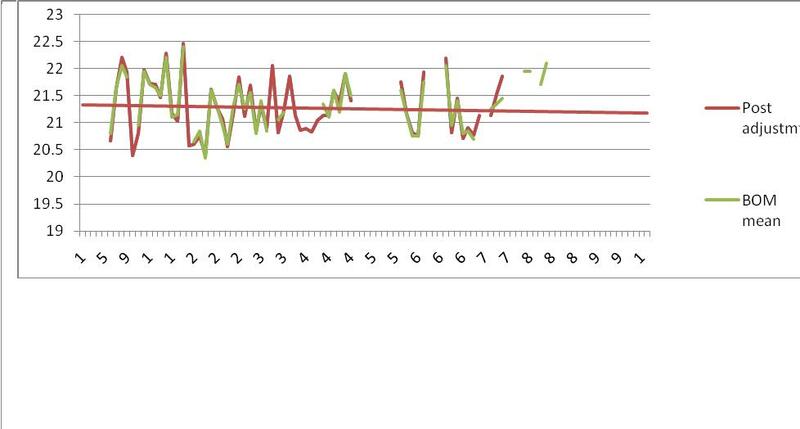 Slightly OT, I downloaded and graphed the temp figures for Gympie some months ago (nothing to do with AGW as such). 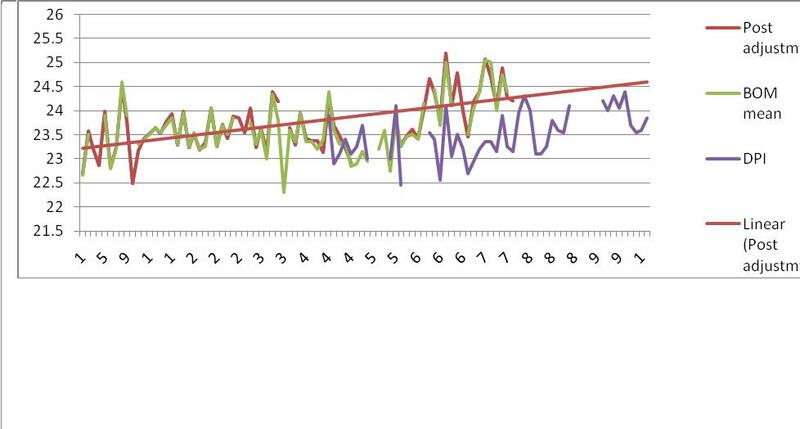 The raw data from BOM comes as maximum/minimum which suited my purposes so I graphed them separately. 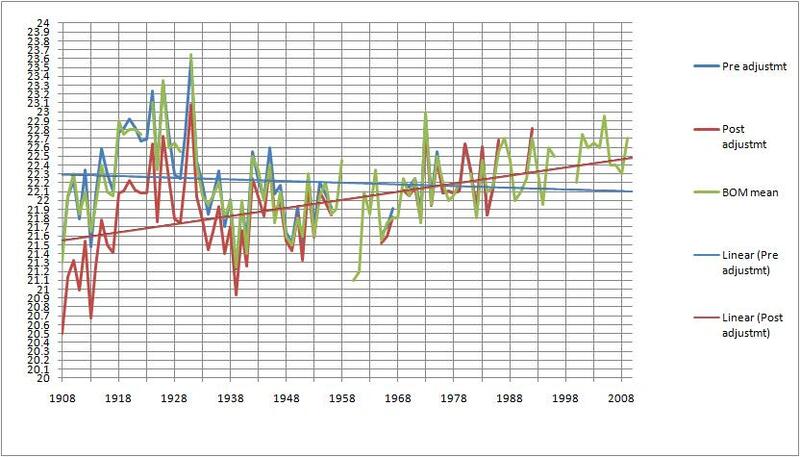 To my surprise the trend for maximums show a decrease of .2 degree C over the period 1908-2009 while the minimums show an increase of .8 degree C. Why is it so? I don’t have the knowledge, maybe one of your learned readers can explain it. But my real point here is this: are we missing seeing what is really happening by amalgamating and averaging all the figures instead of drilling down and looking at the detail? That narrowing of the range is right across Australia. Yes averaging the data only gives a calculation that does not necessarily reflect what is really happening. 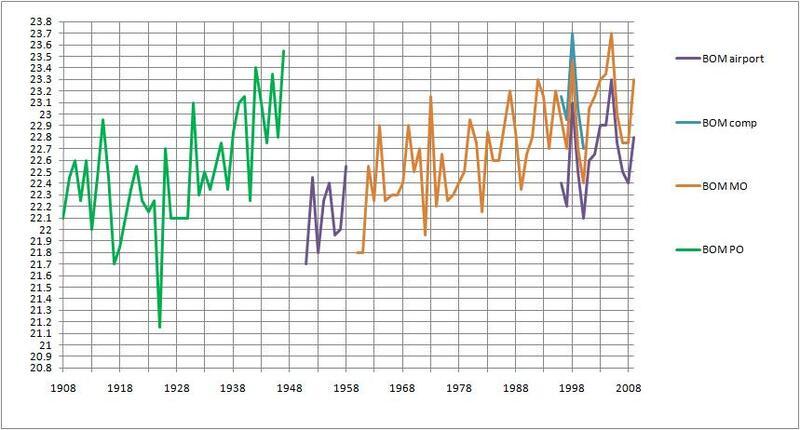 While 1931 was hottest average at Te Kowai, hottest max was 1931 but 1928 and 1915 were very close; highest min was 1936. Hottest summer was 1922-23. And monthly max and min are averages of daily max and min. 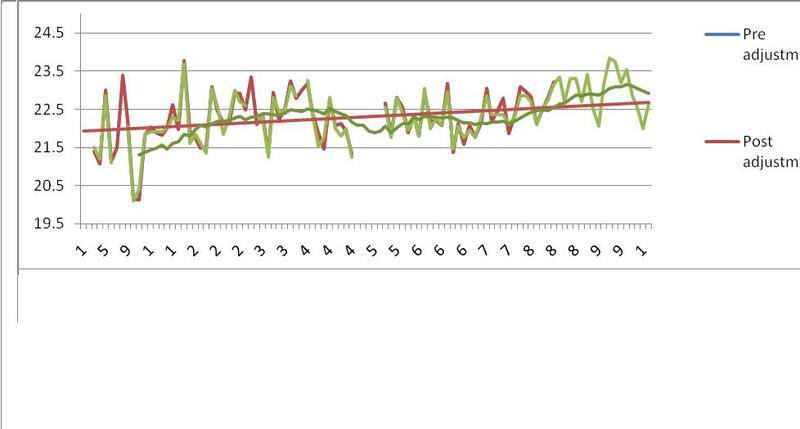 But over long periods the average can show you patterns in the data. One day (when I get a Round Tooit) I intend to plot max and min graphs vs GISS. Now that IS interesting! Who the h… is Torok and why the adjustment? I have been urged to check on data from northern NSW so this will be included. Many thanks. Also thanks to you especially, I found out how to get GISS etc info from you via WUWT. Love browsing your page, always learn random new facts. I received an email from an old engineer from Sydney who was interested in the files of Torok’s Aussie temp adjustments that I had found. He investigated them and reversed the adjustments to the max and the minimum that Torok had performed on Sydney. as you can see the warming is in the minimum temps as you would expect due to UHI effects in the evening. In fact this is what Dr Torok had to say about the UHI effect. Here’s Torok’s account of his adjustments. If you could email me I can give you all the data I have on it. Not just excellent but very important work, Ken. I’m glad that you’re angry and I hope your ire and all the supportive comments will encourage you to keep probing. Great stuff! Could you please contact me via my email as I would loke to pass on some information.